For 2017-18, the Beginner / Instructional program will begin December 3rd and will take place Sundays at the Surrey Sport & Leisure Center at Fleetwood. The program consists of 8-75 minute instructional sessions, and then 8 games. Have any questions? Feel Free to Contact Program Manager Steve King at hna_van@telus.net or by phone: (604) 897-1643. Payment 2 - $307.50. This will be due at the initial beginner meeting, which is an off-ice meeting where you hear about the program, meet your teammates & meet members of the League staff. Payment 3 - $292.50. Paid 30 days later, for a total of $625.00. The playing fee includes 16 ice sessions, instructor(s), referees, scorekeepers, ice times and a basic school jersey & matching sox. Sign Up for the upcoming program today! You'll love it! What's not included - protective equipment & your formal team jersey. Once formed, the team will decide the uniforms, logo & team name and will work, with League assistance, with the jersey supplier of the team's choice. 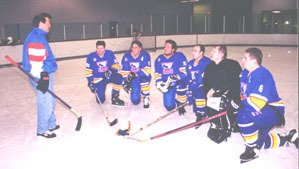 Fast forward 38 years, and you’ve got Hockey North America– the hockey league that has taught tens of thousands of people to play hockey and to this day, continues to innovate with features and service in the adult hockey market that are now the most widely copied concepts in arena & league management today. We might be crushing a few dreams, but to date no one in 35 years of HNA hockey has ever “turned pro” at any level of competitive hockey. So we’ll take away the mystery now. Don’t make any plans on quitting your job to go play hockey for a living.